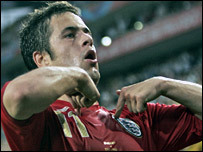 Sweden keeper Andreas Isaksson claims Joe Cole is the key to the success of England's World Cup campaign. Cole scored and was outstanding in the 2-2 draw with Sweden that sealed a last 16 clash with Ecuador on Sunday. Isaksson told BBC Sport: "Cole was England's best player by a long way. He is very important to this England team. "He has lots of skills the others don't have. He scored a great goal, a little lucky perhaps, but still a great goal. We were very impressed with him." Isaksson's verdict was backed up by your player ratings for the game with Cole, who scored 8.45, well clear of all his England team-mates. Isaksson believes England could still progress in the tournament, despite struggling desperately in the second half in Cologne. He said: "England can go very far, but it is a tough competition and from now on any team can win this." Sweden maintained their record of not losing against England for 38 years, thanks to Henrik Larsson's late equaliser. Isaksson said: "I don't know why England can't beat us. "I think we are extra motivated when we play against England because in Sweden we grew up with English football and we watch the Premier League. "It has always inspired us and we have many players who have played in the Premier League. Whatever the reason, we are happy about it and happy England still couldn't beat us here. We take great confidence from that."